Fall Colors are Starting in Maine! Autumn has officially begun, and the Maine colors are starting to show! Interest in visiting the New England colors, and especially Maine’s unique combination of magnificent foliage and breathtaking coastlines, is on the rise. Many ask when the peak time for foliage viewing will be. Of course, it is difficult to predict, but in the Freeport and Mid-Coast area, the second and third week in October are reliably excellent, with the peak usually right around the popular Columbus Day weekend. 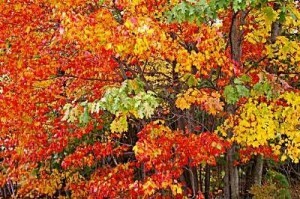 At Brewster House we always celebrate the foliage season with several Fall Foliage packages. Fall Foliage Surf & Turf combines two nights at Brewster House, a two-hour sail on an antique schooner in Casco Bay, gift certificates for dinner at Azure Cafe and shopping at L.L. Bean, a driving tour of foliage areas, and a gasoline card, all-inclusive for $649. Add a third night at Brewster House for only an additional $100 with our Fall Foliage Surf & Turf Extended package. If you are trying to get in a foliage package without the frills, try our Fall Foliage Lite package, with two days at Brewster House, the self-driving foliage tour, and a $25 gasoline card, all-inclusive for $389. As a practical matter, the foliage season in Freeport is usually good from early October through the month. Sometimes there is even good foliage at the end of September (as it is starting to appear will be the case this year), and even into early November. If you want to check on the status of foliage here, we are in Zone 1 on the Maine foliage web site, which is updated weekly with status of the foliage in Maine’s different regions.